Hermann Kermit Warm is going to die. The enigmatic and powerful man known only as the Commodore has ordered it, and his henchmen, Eli and Charlie Sisters, will make sure of it. Though Eli doesn’t share his brother’s appetite for whiskey and killing, he’s never known anything else. But their prey isn’t an easy mark, and on the road from Oregon City to Warm’s gold-mining claim outside Sacramento, Eli begins to question what he does for a living–and whom he does it for. 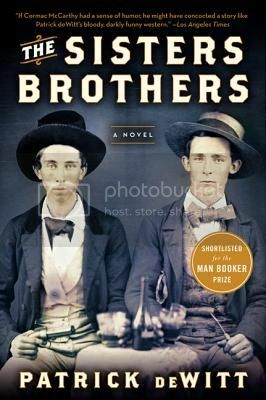 So, there has been much love for The Sisters Brothers, but you just aren’t going to find it here. The writing is solid and the characterizations good, but something about deWitt’s novel just didn’t sparkle for me. Honestly, I think that the issue is that I’m just not into Westerns. I may have had the idea that The Sisters Brothers wasn’t really a proper Western – and perhaps it isn’t, I suppose I don’t really know enough about the conventions of the genre to say with any authority – but it still just didn’t do it for me. Many people found it extremely funny, but deWitt’s humor seems not really to mesh with my own, so it fell flat for me.While it was easy to turn the pages, it was even easier to put the book down, and nothing in particular compelled me to pick it back up. I may be in the minority here, but I failed to love The Sisters Brothers. Jen, I had a slightly improved experience with this book, I think because I listened to it. The narration was excellent and keep me engaged in the story whereas if I was reading I am sure I would have abandoned it. I was appauled by the violence, I just don’t do books like that. NIce review, as always. Thanks! The violence didn’t bother me much, partially because I was not drawn into the book at all, so nothing seemed particularly real or urgent. It sounds like the audio is better, although perhaps the violence would have bothered me more then. I felt almost exactly the same way about it. I didn’t hate it enough to put it down, but I never felt drawn to picking it back up again. I said something similar in my review (although I think I liked it more than you). I enjoyed reading it but I never felt like I HAD to keep going and it didn’t stay with me when I finished. Oh, I’m sorry this didn’t work for you. I have it on my shelf and I still do want to read it but I’ll keep my hopes lowered. I’ve been listening to Doc by Maria Doria Russell and have been surprised by how much I’m enjoying it, given it’s a western and not my usual read. Maybe I should pick The Sisters Brothers up soon while I’m still in the groove. I didn’t really think of DOC as a western, just historical fiction set in the Wild West. I actually loved DOC. This one is much more Western-y. I really, really liked The Sisters Brothers. I fell in love with Eli’s voice and the rhythms of Patrick deWitt’s prose. It’s too bad you didn’t love it, but it’s also true that sometimes good novels speak stronger to certain people than others. It may be the western genre that you’re not into – who knows? But I was inspired to hunt down a copy of Charles Portis’ True Grit after I finished The Sisters Brothers and it’s sitting near the top of my TBR pile, waiting to be read. That’s too bad you didn’t like this one! I really enjoyed it, especially the relationship between the two brothers. Oh well! Not every book can be liked by everybody! This book didn’t work for me either, I also wonder if it’s because I’m not a big fan of westerns. Good review.